Penalty flags litter the political gridiron in Virginia, as revelations and allegations involving the Governor, Lieutenant Governor, and Attorney General have rocked Richmond. But for the Commonwealth’s General Assembly, it’s halftime. Reaching the midpoint of the short, 46-day legislative session last week means we arrived at “crossover.” Crossover is the juncture at which legislation in one chamber must be voted out and sent to the other chamber or it is benched for the year. 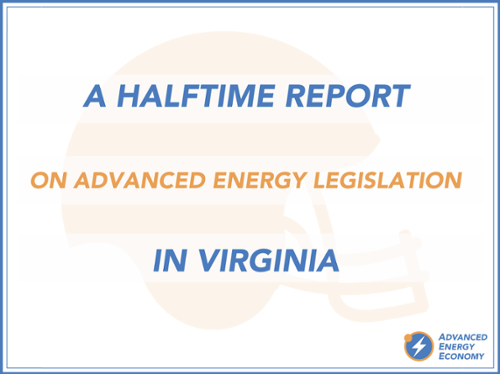 So here is a halftime report on advanced energy legislation in Virginia – what bills are still in the game, and which have been sent to the locker room. Last year saw significant gains for advanced energy in Virginia, so legislators have scaled back their ambitions this year. Nonetheless, advanced energy has continued to pick up yards through targeted legislation. Building on last year’s breakthrough energy omnibus bill (SB 966), energy efficiency would make further headway with a pair of bills. SB 1662, which Virginia AEE has championed, would increase transparency around the regulatory reviews of demand-side management (i.e. energy efficiency) proposals, making it harder for regulators to unilaterally deny or cut the budgets of effective conservation programs. It would also ensure those programs aren’t hamstrung by arbitrary time constraints. Meanwhile SB 1605, another key measure for Virginia AEE, would strengthen the EE stakeholder process established last year, codifying that the group should run for the next decade and report back to the General Assembly on its progress. The Senate approved both bills on Friday, Feb. 1, with broad, bipartisan majorities. After making big gains last session, renewables have largely held their field position in 2019. Legislation to expand Virginia’s pilot PPA program, which has allowed schools, churches, and localities to go solar, was taken down in committee, though HB 1928 received bipartisan support in the House. The solar industry and investor-owned utilities remain at odds, but the co-ops and solar companies managed to forge a compromise that will see the caps on distributed generation rise and PPAs grow among Virginia cooperatives. That bill, SB 1769, also passed the Senate on Feb. 1 and is now before the House. Advanced transportation has largely remained the purview of the Executive Branch. Virginia was first out of the gate with VW funds, awarding AEE-member company EVgo with the RFP to develop a public charging network. This session has seen complementary legislation, which would allow state agencies like the Virginia Department of Transportation to locate charging stations on their property. HB 1934 passed the House on Feb. 5. As the session got underway, legislation expanding energy choice in Virginia seemed to be on the march, but the drive petered out. Four bills to expand market access for large buyers and consumers interested in 100% renewable generation garnered bipartisan backing. Unfortunately, legislation introduced by Commerce and Labor Chairman Kilgore that would effectively bring such activity to a halt by creating new restrictions on when and under what conditions consumers could shop for the energy they want blindsided corporate buyers and competitive service providers. Through negotiations between buyers, competitive providers, and Appalachian Power, a compromise was reached that largely preserved the status quo, but the process cost advocates much needed momentum. Ultimately, the bills to expand energy choice went down to defeat in committee, while Kilgore’s bill, HB 2477, passed the House and moved on to the Senate. The solar industry also had to play defense on two fronts. Late breaking legislation in the House attempted to accelerate the sunset date for tax exemptions for solar projects from 2024 to 2020, but that legislation was halted in committee. The industry also had to contend with legislation that would impose weighty decommissioning requirements on solar projects. After discussions with industry, the sponsor of SB 1091 amended it to remove those burdensome requirements and keep the decommissioning process at the local level. The 2019 legislation session is itself, in a way, halftime between two critical sessions for advanced energy in Virginia. As noted before, the 2018 session saw the passage of omnibus legislation that advanced utility-scale renewables, energy efficiency, and grid modernization. This November, all 140 members of the General Assembly – i.e. all 100 Delegates and 40 Senators – will be up for election. With both chambers narrowly divided, any change could markedly shift the balance of power in Richmond. Depending on the outcome this November, in 2020 we may see legislation to establish an EERS, expand access to distributed generation, and link Virginia with RGGI – just a few policies that did not make it past crossover week this session. In the interim, Virginia AEE will continue working hard to educate lawmakers, elevate our industry, and ensure that our business voice informs Virginia’s energy policy. We’re building a playbook to make sure our industry keeps moving the ball down the field!